The potential for icing dangers begins on the ground, and several international organizations are working to standardize training, quality control and procedures to improve communication and safety. Even as researchers study ways to improve detection of in-flight icing and make airframes and engines more resistant to icing conditions, they continue to struggle to understand the icing phenomenon–especially the formation of ice crystals–according to speakers at a conference on the subject organized by the European Aviation Safety Agency (EASA) in Cologne, Germany recently. Ice-prevention techniques present their own challenges, which aircraft makers, airports and ground handlers are endeavoring to solve. Icing was the primary cause of 80 accidents in the past 10 years, resulting in 263 fatalities worldwide, according to EASA numbers. It is a contributing factor in many more events, added John Vincent, EASA deputy director for strategic safety. What’s more, “traffic is increasing in Asia, and the tropical climate there is a good place for ice crystal formation,” said representatives from engine manufacturers Rolls-Royce and Snecma. Outdated knowledge–and the industry’s failure to update its information to reflect current conditions–presents a significant problem, said Norbert Lohl, EASA’s certification director. “Climate change has made flight envelope definitions obsolete, something we found out almost by chance,” he told AIN, and current engine specifications are thus based on 1950s knowledge, he went on. He cited the 2008 accident involving a Boeing 777 at London Heathrow Airport: investigators found that lower-than-expected temperatures at the long-legged airplane’s prolonged cruise altitude caused ice to form in the fuel tanks. Meteorologists already know that new icing phenomena and temperature distribution are a reality now, Lohl asserted. Engineers now understand the basics of how ice crystals can create engine icing in flight, but they do not completely understand the phenomenon yet, said EASA initial airworthiness rulemaking officer Xavier Vergez. Ice crystals bounce off freezing surfaces near the front of the engine and enter the core, explained Richard Lewis, Airbus’s certification manager for icing. He was speaking on behalf of the international coordinating council of aerospace industries associations. Then, in the compressor, ice crystals melt on vane surfaces, creating a film of water. Particles continue to impinge on the wet vane, cooling the vane to the point that it becomes cold enough for ice to form and accrete. Eventually the ice breaks off, possibly causing various engine malfunctions, including flameout. To develop a better understanding of the physics involved, an international research team involving EASA and the FAA will convene in Darwin, Australia, for two months early next year to study clouds in both oceanic and continental convection that contain a lot of ice water . Researchers will sample three altitudes, corresponding to three different temperatures (-10 degrees C, -30 degrees C and -50 degrees C), said Fabien Dezitter, coordinator of Airbus’s icing research and technology activities. “This will help us validate or update our new appendix P of CS-25 aircraft certification,” Vergez said. The appendix P (now at the “notice of proposed amendment” stage) addresses ice crystals and the mixed phase in which liquid droplets and ice particles coexist in a cloud. The new appendix O, at the same regulatory stage, addresses supercooled large droplets. Both appendices O and P require the aircraft to be able to safely exit or fly in such conditions without restriction. Lewis emphasized that new rules should not stifle innovation. Rules may become complex to the point that they thwarting the priority to reduce fuel burn, he said. Several speakers cited a lack of suitable ways to test and analyze theories, such as up-to-date icing wind tunnels, computer models and so on. Existing sensors for detecting in-flight icing have limited reliability, according to Didier Cailhol, a safety and continued airworthiness specialist with ATR, because they detect ice only on the sensor itself. It is possible, he said, for the sensor to be covered with ice while the rest of the wing remains ice free–or, worse, vice versa. Other sensors that detect icing conditions rather than ice accretion on aircraft surfaces are quite reliable, Cailhol said. However, they cannot detect ice crystals, Airbus’s Dezitter pointed out. Equipment manufacturer Zodiac Aerospace is developing two new in-flight icing detection systems (Fids). Scheduled to enter service in 2015, the first will detect supercooled droplets measuring less than 50 microns in diameter, a size consistent with current standards for large aircraft (CS-25 appendix C). What’s new, according to Zodiac, is that the new Fids will be reliable enough in positive temperatures (0 to 10 degrees C) to be certified as a primary system (PFids), with authority to trigger anti-icing systems based on actual ice detection. “Aircraft flight manuals usually require pilots to start icing-protection systems when flying in visible moisture at a temperature of less than 10 degrees C, which provides ample margin but consumes a lot of energy, thus affecting fuel burn,” a Zodiac engineer told AIN. The second PFids, using laser interferometry, will be able to tell which form of ice–supercooled large droplets, crystal and so on–is threatening the aircraft. Flight-tests are slated for 2016, followed a year later by service entry. On the ground, some basic issues remain unresolved. Runway friction measurement, for example, assesses the state of the runway, which is not exactly the information the crew needs, pointed out Jean-Louis Pirat, scientific advisor at France’s civil aviation authority (DGAC) and chairman of the ICAO aerodrome panel. A lot of other parameters, such as tire pressure and vertical loading, should be factored in for the crew to have an idea of how effective their braking action will be. Today’s friction-measurement devices can introduce significant imprecision of up to 30 percent, and authorities are eying the expertise of friction-measurement operators as an area for improvement. Although safety records show that such measurements by even competent ground personnel may be quite reliable, the authorities deem them to be not entirely satisfactory. The EASA thus plans to evaluate a prototype of a new breed of measurement tools, said Vasileios Stefanioros, EASA airport rulemaking officer. On-ground icing detectors would prove useful, in that they could indicate how close the aircraft is to the end of its holdover time, the point at which an application of anti-icing fluid is no longer effective. Such a tool does not currently exist for aircraft. Jussi Ekman, a Finnair pilot and representative of the European Cockpit Association, is particularly unhappy with this shortcoming. Technologies enabling on-ground detection have existed for decades, he asserted, expressing unease about the absence of any requirement for such sensors. 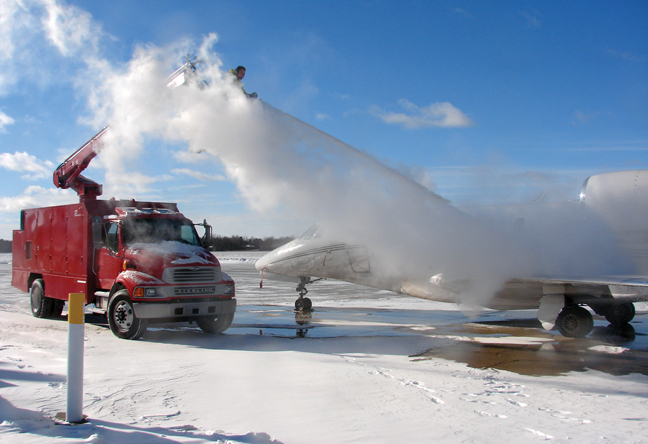 Anti-icing fluids appear to be the source of potential problems, sometimes serious ones. When the glycol (the fluid’s main ingredient) evaporates, it leaves a residue that can build up, for example, on control-surface hinges. This glycol-free residue can rehydrate and freeze. In fact, in 2005 such residue blocked the control surfaces on a BAe 146 in Frankfurt, causing a serious incident. A BAe ATP taking off from Helsinki, Finland in 2010 suffered similar consequences when fluid ran into too narrow a gap between the stabilizer and the elevator. Because operators and ground handlers in charge of de-icing do not necessarily share the same requirements or procedures, ICAO, IATA and standards organization SAE have been conducting a harmonization effort since late 2011 that aims to standardize methods, training, quality control and phraseology. Even pilots are not always clear on what anti-icing can–or cannot–do. An icing expert at a major European carrier said he once learned that a young pilot was counting on anti-icing sprayed before takeoff still to be effective at his destination. Runway de-icers pose another problem. They cause catalytic oxidation of carbon brakes, which can go undetected until an incident occurs. For example, the hydraulic actuator may penetratea softened carbon disk, meet a harder component, break and release hydraulic fluid onto hot parts, resulting in a brake fire. Unfortunately, those de-icers that generate the most oxidation are also those in growing use, as they comply with ever-more-stringent environmental rules.